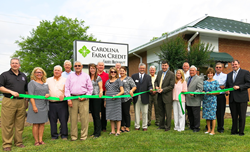 Carolina Farm Credit hosts open house at newly renovated Roxboro branch. Vance C. Dalton, Jr., CEO of Carolina Farm Credit, announced that on Monday, June, 8, 2015, the Roxboro branch of Carolina Farm Credit hosted an open house event at their newly renovated location at 607 Leasburg Road, Roxboro, NC. The event featured a welcome and introduction of guests by Carolina Farm Credit Regional Lending Manager Fred Pittard, invocation by Person County Sheriff Dewey Jones, and special comments from Carolina Farm Credit CEO Vance Dalton, Carolina Farm Credit Chairman of the Board Mark Bray, Roxboro Area Chamber of Commerce Board of Directors Chairman Derrick Sims, Roxboro City Councilman Mark Phillips, and Person County Board of Commissioners Chairman Kyle Puryear. Special comments were followed by a ribbon cutting ceremony. The 2,000 sq. ft. office was renovated by MCT General Contractors, Inc. in Monroe. The renovation included extensive upgrades and improvements to the inside of the office as well as a new metal pitched roof. The project was started in October of 2014 and completed this March. “The newly renovated building allows us to enhance customer service and better meet the needs of our Person County customers,” said Vance C. Dalton, Jr., CEO of Carolina Farm Credit.